All the 4 of us got up early, packed, had continental breakfast, and took the airport shuttle to the Oslo airport to catch the 0830 SAS flight to the town of Bodo in the arctic circle. As usual, the weather was like Seattle, light snow, dark clouds, but a few degrees colder. Although SAS only allows 1 checked luggage and 1 carry-on, we all ended up carrying 2 carry-ons. My camera bag weighed about 13 kg/28 lb and a shoulder bag with medicines, powerstrip, cables, etc at around 2 kg. As I had limited space in my Timberland duffel bag that I had checked in, I looked like a colorful Michelin Man with 5 layers of clothing, my body just another transport mechanism for Arctic winter clothing. Just like IcelandAir, nobody seemed to be bothered by this or my carry-ons. You get 2 hours of free Wi-Fi at all Norwegian airports and all of us exploited the privilege taking care of business – aka FB & Whatsapp. Susheela and Dash had SIM issues that they spent the time hounding the guy back in Bangalore who handled support. Flight left on time and we were all anticipating to step foot in the Arctic Circle in 1.5 hours. I ordered a glass of apple juice and the flight attendant asked me for my credit card – yes, other than water, coffee, and tea, you pay for everything else on internal flights in Norway. The juice set me back US$3. The flight landed at Bodo on time at around 10. 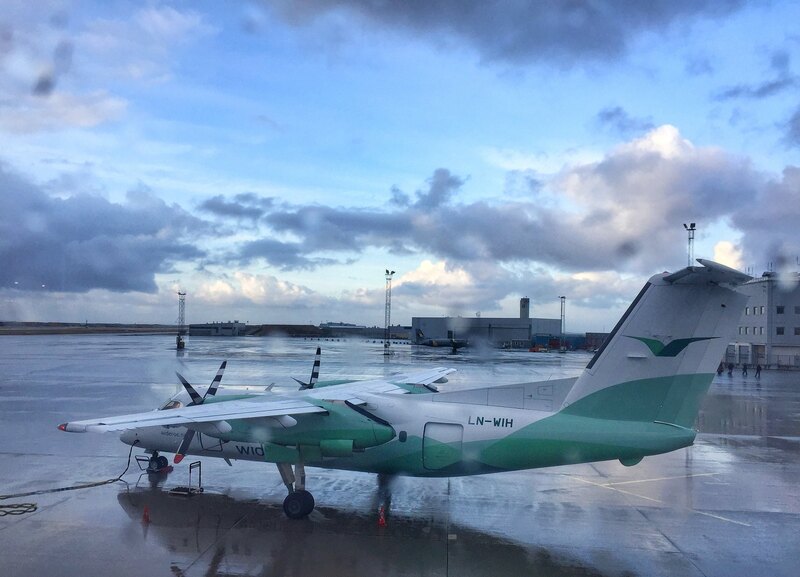 We sighted the Widerøe Airlines “puddle jumper” that would take us to Leknes, 100 miles away, the landing spot for all tourists flying to Lofoten Islands. The plane was packed and the 20 minute flight over the Norwegian Sea was a bit bumpy especially just before landing. The flight landed on time at around 1145. 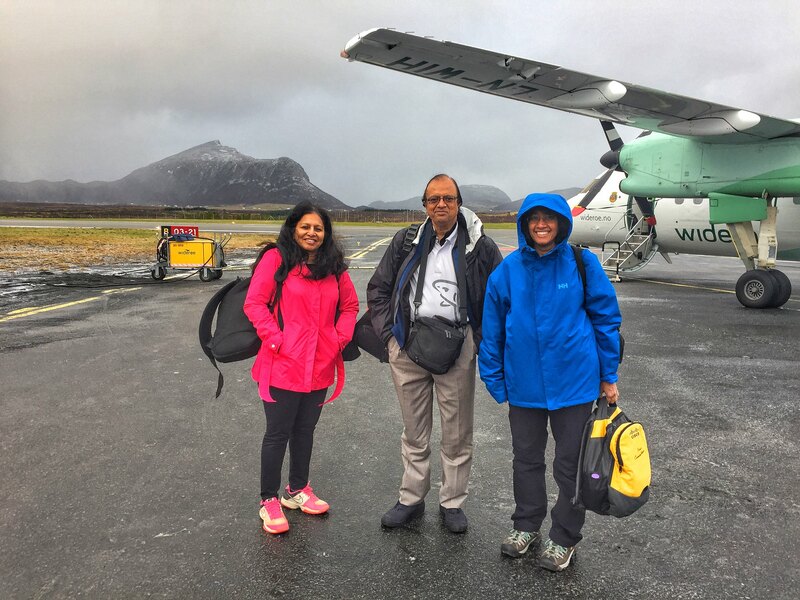 Revathy’s Nikon immediately went into action capturing the Arctic scenery around the Leknes airport. The checked baggage showed up promptly. In the meantime, Dash walked to the Avis counter (there were just 2 rental car counters, one for Avis and one for a local outfit) and signed the agreement. He also paid about US$20/day for $0 deductible collision insurance. Based on our experience last year in Iceland, paying the additional $ was a no-brainer as minor scratches can end up costing you north of US$5,000!!! The Avis guy was super helpful. That morning, we were his only customer. In Norway the rental car companies charge an arm and a leg if you decide to drop off at a different location. 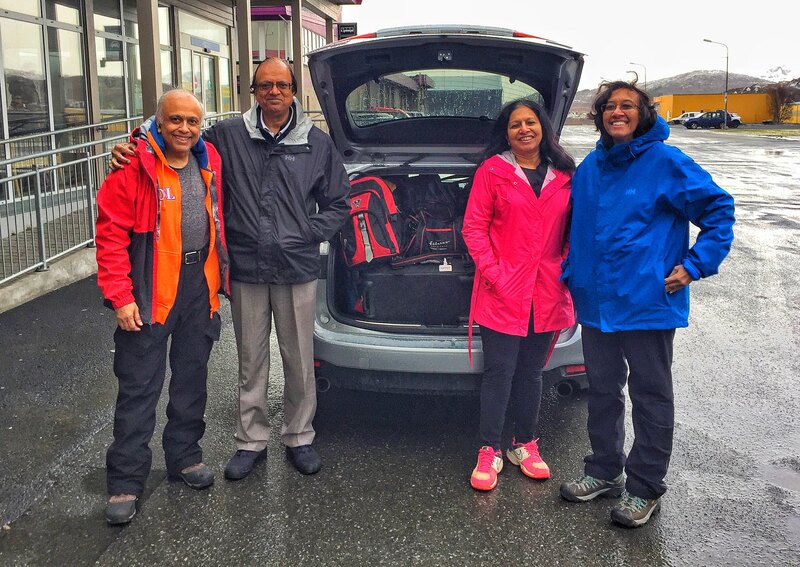 As we were leaving the Lofoten Islands from Stamsund 10 miles away, we had 2 choices: Drop off the car back at the Leknes airport and catch a cab to Stamsund costing around US$50 or drop the rental car at Stamsund Hurtigruten terminal and pay the drop off charges. Luckily the Avis guy lived in Stamsund and he preferred we dropped off the car at the Hurtigruten terminal. God bless the AVIS guy. We got a 5-door Mazda 6 with awesome studded winter tires and automatic transmission. Although at the time of booking the websites show only manual transmission cars, Norwegian rental car companies have figured out that most Americans don’t have a clue driving manual transmission cars. Outside of Oslo and possibly Bergen, unlike Reykjavik, it is impossible to get a big SUV such as a Jeep Grand Cherokee in Norway. Trunk capacity of cars in Lofoten is about 30% less than the SUV we rented in Iceland. All of our stuff fitted into the car snugly. Note that in addition to our luggage, we had to allocate space for groceries and other incidentals that we would be picking as we drive around. According to Wkipedia, my bible for trivia, Leknes’s population is about 3000 and is one of the few towns in Lofoten that does not depend on fisheries and does not have its town center by the sea. 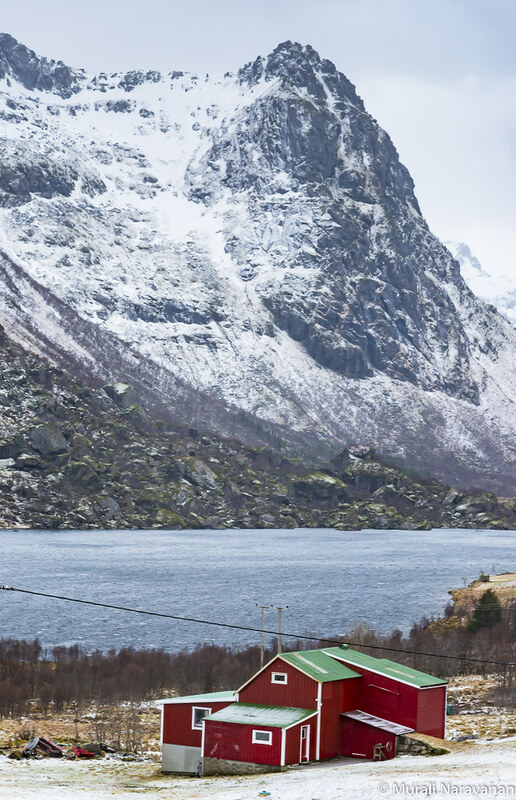 Because of this, and because of its rapid growth in recent years, it does not have the same traditional wooden architecture, as most other towns in Lofoten, and may thus not be as picturesque as its neighboring fishing villages. Net: Don’t waste time looking for red houses in Leknes!!! Our #1 priority was to pick up groceries. If you are a vegetarian, you can safely assume that you either live on yogurt and chocolate or cook. Considering we had a master chef, the choice was a no-brainer. The grocery stores in Leknes were much bigger than the ones we encountered everywhere else in Lofoten. As we planned to stay for 7 days in Lofoten, we loaded up at the only Asian grocery store in Lofoten (Asia Mat) and at a major Norwegian grocery store chain Bunnpris (Bottom Price in Norwegian). 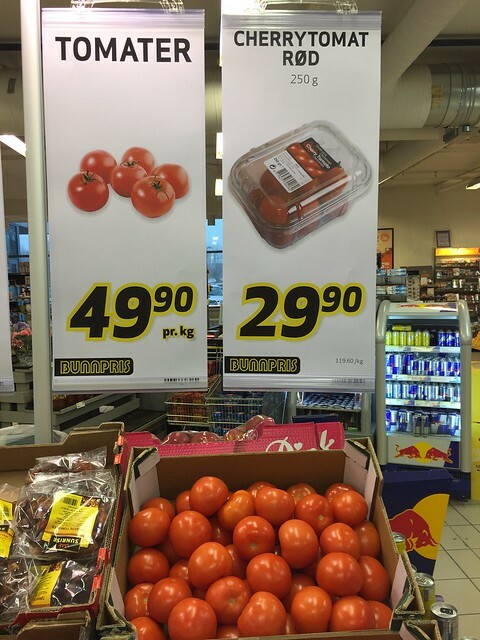 We got pretty much everything we wanted but vegetables cost 2-4x more than in US. 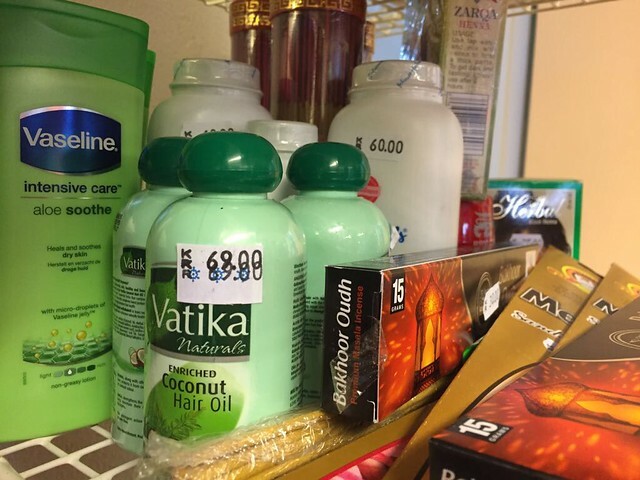 The cost differential was not compelling enough for us to switch to eating cod or reindeer meat although 7-day supply for groceries for the 4 of us set us back US$250!!! 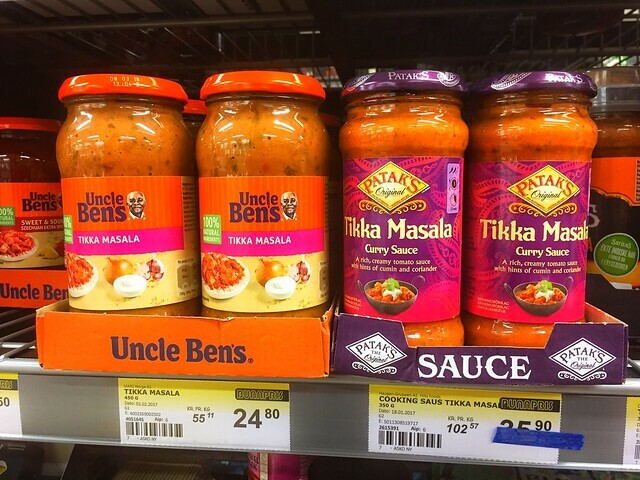 Who said you can’t find Indian groceries in the Arctic Circle? Located Peppes Pizza restaurant part of a big Norwegian chain. The decor was very nice and service was excellent. A large veggie pizza, 2 salads and 1 garlic bread cost US$60.After lunch, we started driving towards Hamnøy, about 35 miles away, our base for the next 3 nights. The temperature was in the high 20s F (around -3 deg C) but was super windy and was a challenge to setup my tripod to shoot images. Located the first red house between the towns of Napp and Vareid and grabbed this image. As it was already getting dark, we didn’t stop anywhere and drove straight to our cabin at Eliassen Rorbur in Hamnoy. 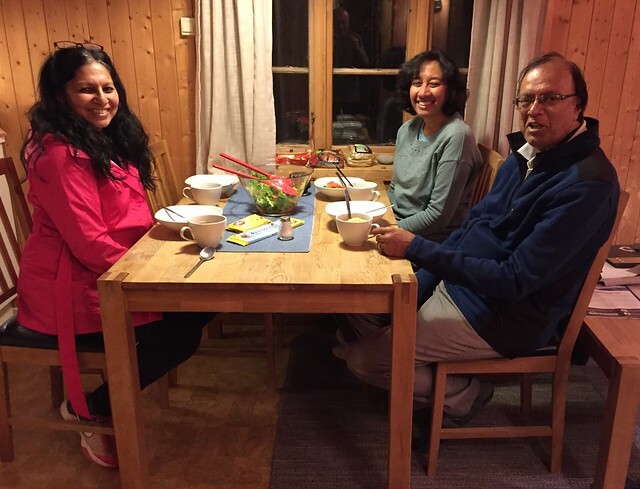 Dash was ably supported by Revathy and Susheela for preparing a nice dinner. Hit the sack after dinner. Serious photography began on Day 3. This is a great writeup. Love that you actually did the food shopping + cooking! I always tend to just eat out on these trips, and I think you solution is probbly better. wow amazing trip thank you for sharing! we also went to Lofoten this year. Maybe you would like to check out my drone video on my page. cheers.